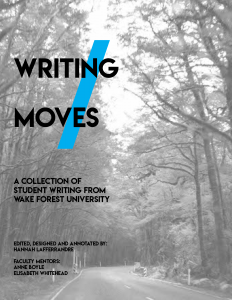 The Wake Forest Writing Program has published the first issue of Writing Moves, an online journal featuring “the interesting rhetorical moves of Wake Forest undergraduates.” The publication was edited, designed, and annotated by English major and Creative Writing minor Hannah Lafferrandre, with help from faculty mentors and editors Anne Boyle and Elisabeth Whitehead. The journal aims to not only encourage readers to become lifelong readers and writers but also to serve as a pedagogical resource for faculty and students. To that end, each essay includes the professor’s assignment as well as commentaries from the student writer, their professor, and the editors about the essay’s rhetorical strategies and the student’s writing process. Writing Moves will host a celebratory reception for the student writers and faculty on Wednesday, April 18 from 4 to 5 p.m. in Ammons Lounge (Tribble A107). The first issue covers the 2016-2017 academic year. You can read it online here or view it as a PDF.